30hp Trane Climate Changer Draw-Thru Air Conditioning air handler unit chilled water heat exchanger. This unit is still installed and operating at the time of initial listing. 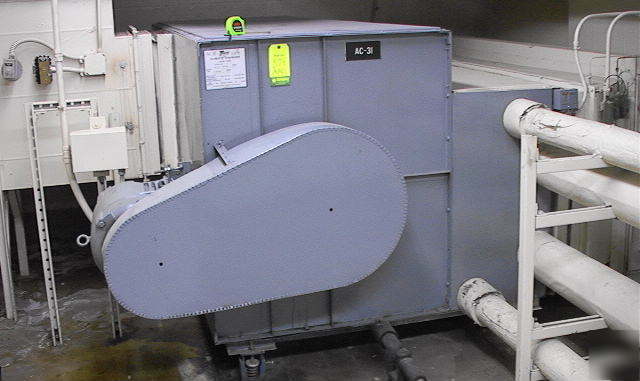 This looks to us like a big air blower and coil unit-no refrigeration compressor ,etc. It uses chilled water in the heat exchanger to cool the air going through it. The chilled water has to be supplied by a separate system. Base on the blower power rating, we are estimating this unit can provide something on the order of 100 tons of cooling. This unit is about 114" long by 8' wide by 55" tall as it sits. The following images were taken after the unit was removed from the factory. The fan hole is about 27 to 28 inches square. The overall width of this part of the unit-fan and heat exchanger- is about 62 inches. The heat exchanger area is about 103 inches wide by 31 tall. Might be just what you need for your serious air conditioning application. good used as shown. Was running in factory when the first of these images were taken.